When it comes to being prepared, every adult should have an estate plan (Last Will and Testament, Power of Attorney) in place. An estate plan provides protection and care for your property, your children, or your own care in the event you are incapacitated or you pass away. Since an estate plan is something we ALL need, the availability of do-it-yourself estate planning has become more and more popular. But be warned! Choosing to create your own estate plan without the assistance of a competent estate planning attorney can create future problems or worse, future costs for you and your family. Here are 5 reasons why you should hire an attorney for your estate planning needs instead of going at it alone. An attorney can tell you exactly what you own. Seeking the advice of a competent attorney isn’t just a form service. An attorney’s advice can help you classify your property and determine what you really own in the eyes of the law. This becomes a major issue when looking at the property of married couples. Determining whether the property is your separate property (you own 100%) or community property (you and your spouse each own 50%) can become a real hassle. Remember, you can’t give away what you don’t own. An attorney knows the language of the law. Your estate plan documents are meant to be read at a time when you are unable to express your own wishes. It is important that your documents are written with the language you need to express your intentions clearly. In the event there is confusion when reading your documents, the law will likely provide a default decision that may not follow your wishes. Hiring an attorney to create these important documents can ensure your wishes are clearly written and the default decision of the law doesn’t interfere. An attorney can create backups if your plans fall through. So, you know who you want to give your property to when you die? What happens if that person or persons pass before you or they refuse your gift? An estate planning attorney can help you create proper alternatives to make sure your property is still taken care of in the face of an unexpected event. 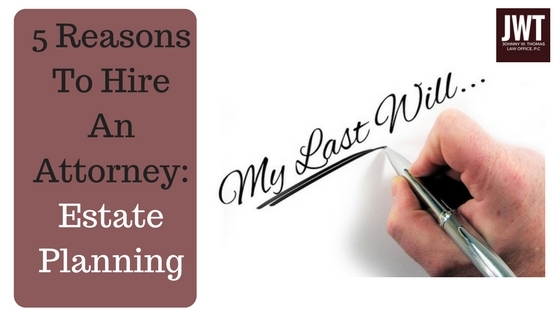 A lawyer can make sure your Last Will and Testament meets the requirements to be valid. Hiring an estate planning attorney to draft your Last Will and Testament can eliminate additional future expenses for probate. An estate planning attorney can draft a Last Will and Testament that meets the requirements of a valid will in Texas and it stands without proof of other witnesses. It is important to know that if a Court rules a will is invalid, your property will have to pass in accordance with Texas law and not your wishes. An estate planning attorney can be a trusted advisor for your family in a time of loss. In a time of grief, it can be comforting to have a trusted adviser to navigate the probate process with your family. Though your family will not be required to hire the same attorney who drafted the will to handle the probate, many family members find great relief in not having to spend time searching for legal advice at a time of loss. If you want to take the right steps to plan for the future, don't go it alone. An attorney's help can be invaluable as you go through this process.